Pave and side stone settings are a variation of the traditional three-stone setting, generally featuring a single central stone with other stones mounted either in a cluster around the central stone, or inset into the ring's band. Whether you're considering a pave diamond ring or pave diamond engagement ring, a pave diamond wedding ring, or pave diamond anniversary ring, your ability to express your love and creativity through the ring's design is limited only by your imagination and your budget with these infinitely flexible settings. 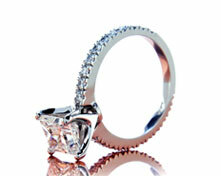 The pave setting (pronounced pah-vay) creates a carpet of brilliance across the entire surface of your ring. The central diamond or other gemstone is literally surrounded or ringed by smaller accent diamonds, diamond melee, or other gemstones. The name pavé comes from the visual effect created by grouping a number of diamonds so closely together that the ring looks as though it's "paved" or encrusted with gems. Side stone settings are a more general expression of the three-stone setting concept in which small diamonds or diamond melee are inset either into the channel set or shared prong shank of the side stone diamond of the side stone diamond ring. Again, your options for variations and customization of your side stone diamond engagement or wedding ring are nearly unlimited. Love is as diverse as there are hearts in the world. 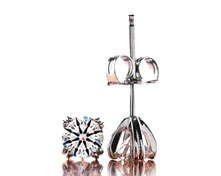 Choosing the ring setting and design that accurately expresses your love and all that it symbolizes can be a challenge. For maximum impact, brilliance and performance, we recommend using a Brian Gavin Signature Hearts and Arrows brilliant round diamond or a Signature Princess Cut diamond as the central stone with either of these flexible settings. If you have a specific diamond ring design in mind that would work well with a pavé or side stone setting, contact us, and our skilled custom designers will collaborate with you to produce a stunning and brilliant reality of your idea, creating a diamond engagement, wedding or anniversary ring that will be remembered for a lifetime.